The Dallas Cowboys have their eyes on this year's safety draft class, bringing in a plethora of prospects for official visits the last few weeks. 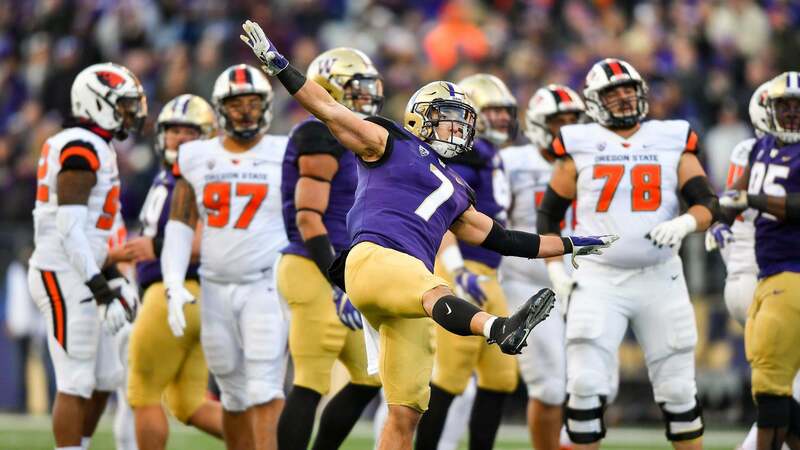 One of the main safeties which has been linked to them, and has been talked about by many (including myself) as a strong fit within the Dallas Cowboys' secondary is Washington's Taylor Rapp. Rapp could fit immediately at strong safety for Dallas, complimenting free safety Xavier Woods' skillset very well. At his Pro Day this week, however, Rapp saw a slight decline in his draft stock due to some poor testing numbers. In particular, Rapp posted a 40 yard dash in the 4.7s, with some people reporting it was a high as 4.77 seconds. Obviously, this is a disappointing time for Taylor Rapp as a 40 in the mid 4.7s is slow for an NFL safety. But I don't think it's quite time to worry about him as a prospect just yet. Even with this lack of long speed, Rapp is still a prime strong safety candidate at the next level. I still believe Rapp can function in the box, both in short zones and against the run. He's also still a reliable tackler, and remains a sticky cover guy when asked to do it on his college tape. Where the 40 time would worry me, though, is in terms of his coverage ability translating to the NFL. And it would certainly worry me if you are trying to make Rapp your middle of the field safety, or force him into a man-free role. Luckily, if drafted by the Cowboys, I don't seem them utilizing Rapp in the slot to cover shifty receivers, or on the boundary where his lack of long speed could be exposed. Dallas has a niche need of sorts which Rapp could fill, and he's athletic and talented enough to cover tight ends while functioning as a "box safety." All in all, what Taylor Rapp's Pro Day might effect the most has nothing to do with his ability on the field, but rather where he ends up being drafted. Projected as a top 40 pick over the last few months, maybe Rapp's slow 40 time has dropped him into the Cowboys' second round range. If this is the case, Dallas likely won't think twice about jumping on the opportunity to add Rapp to their secondary.